As if Subaru's erectile year-over-year growth wasn't impressive enough, now they've gone and nabbed three of the ten awards from Consumer Reports this year. This is from a brand that, charitably, makes seven cars (if you count the WRX and XV Crosstrek as non-Imprezas and Outbacks as non-Legacys). Mostly, we ignore car awards because they're circle-jerk media plays designed to attract recognition (and advertising) and shouldn't be trusted. But Consumer Reports doesn't accept advertising so... it's kind of important. The Tesla Model S nabbed the best overall pick, of course, because it does things no other car can do, but I'm less impressed by a great $100k+ car than I am by a great $30k- car. The Impreza, Legacy, and Forester are all tops in their class, beating out stalwarts like the Camry, CR-V, and Civic. 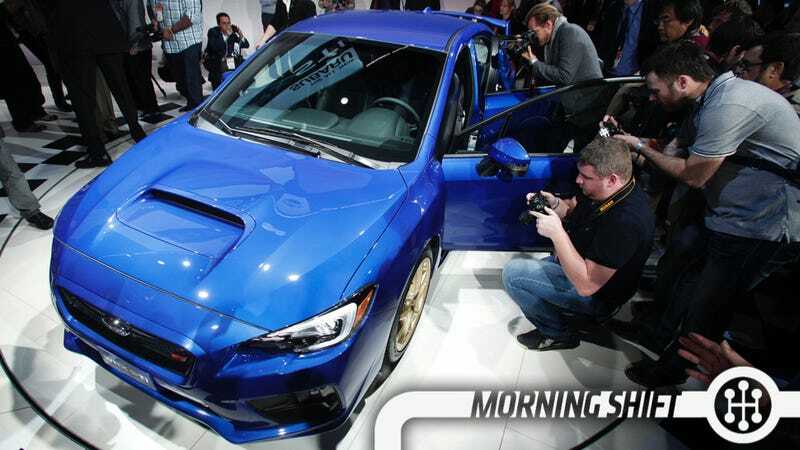 That Subaru can sell so many more cars, take advantage of a sinking yen, and also build cars that are exactly what they want to be for the market they want to get is impressive. Volkswagen should just hire everyone great away from Subaru. The most fascinating supergroup since The New Pornographers has to be the ten-automaker-strong consortium of almost every major auto brand impacted by the Takata crisis. Realizing how fucked they are, these groups joined forces to figure out what the hell they're going to do. Specifically, they're going to hire rocket scientists. A group of 10 major automakers are expected to announce as soon as this week the selection of a major firm with significant experience in aerospace and rocket propellants in the investigation into faulty Takata air bags, according to two people briefed on the matter. The announcement is expected as air bag manufacturer Takata Corp. has briefed government investigators on its testing done in connection with a German engineering firm Takata hired to try to understand the root cause of a string of air bag explosions linked to six deaths and at least 64 injuries. Air bags can explode and propel metal fragments that can seriously injure or kill drivers and passengers. I hope to never engineer a problem so complex that you had to go to Cal Tech to unwind it. 3rd Gear: What Is A Road? Is a road just a connection of ribbons of pavement? Are the signs part of the road? The right-of-way? The cars? The signals being bounced around between cars? There's currently a bill in the U.S. House that would allow our dwindling reserve of transportion funds to be spent on vehicle-to-vehicle communications as well as the actual physical infrastructure. The Freep reports that it has wide support from automakers and planning agencies. While certain members of the Supreme Court think racism has been eradicated, smart people know better. Sure, we see fewer overtly hateful acts on a day-to-day basis, but the institutional discrimination that lives just under the surface of so many of our structures is far more damaging. A great example of this is how banks have been accused of saddling minorities with disproportionally high interest rates for cars compared to rates for white borrowers with similar credit histories. While most finance units haven't admitted to undertaking in these practices, they've spent around $135 million settling cases to make them go away. Now, according to the WSJ., JP Morgan is in the crosshairs. The largest U.S. bank by assets said in a securities filing disclosed Tuesday that it is in talks with the department about potential “statistical disparities” in interest rates for auto loans originated by car dealers. The bank has been in discussions with the Justice Department for weeks, people familiar with the matter said. It is unclear when or if a resolution, settlement or civil lawsuit filed by the government will occur. We'll be watching this one. While most automakers have been working quickly to build plants in the NAFTA zone, there's been a recent push to consider plants in other parts of the world as the dollar starts getting closer and closer to the euro. Not surprisingly, its Daimler's labor chief Michael Brecht who made remarks earlier that it makes less strategic sense, perhaps, to keep trying to build everything in the U.S. with the Euro in the crapper. Of course, if Europe turns around that'll seem like a smarter long-term solution. American drive-in movie theaters experienced their golden era during the 1950s, but some Floridians were watching movies under the stars in their cars even before then: The city of Miami gets its first drive-in on this day in 1938. The Miami drive-in charged admission of 35 cents per person, which was more than the average ticket price at an indoor theater, and soon had to trim the price to 25 cents per person. Neutral: Would You Buy A Subaru? If you were in the market for a new car would you at least cross-shop it?